Barcelona: The Catalan government said Sunday it will go ahead with an independence referendum despite a crackdown by the central government in Madrid which has branded the vote illegal. "The government today is in a position to affirm that we can celebrate the referendum of self-determination -- not as we wanted, but (it will have democratic) guarantees," government spokesman Jordi Turull told a news conference. While some polling stations would not be able to open, the government has a "universal census" of voters which will allow people to cast their ballots at any voting station using their passport or other personal identification document, he said. "This will slow down the process but it will allow everyone to vote as long as there is a school open," he said. Turull said there would be ballots papers at all polling stations but voters could also use home-printed versions of the ballot papers downloaded from websites. 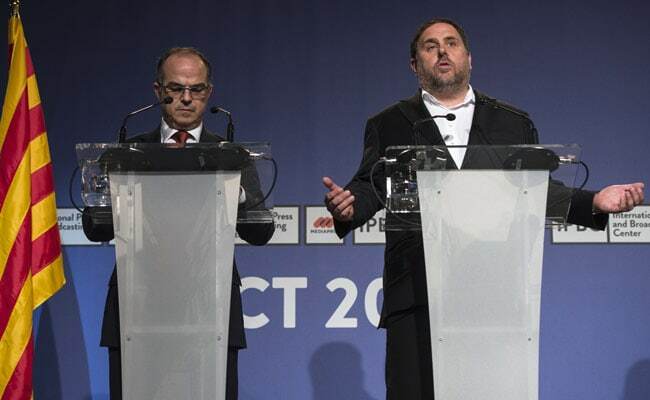 "The government will do everything possible so Catalans can vote," Turull said. A group of "academics and professionals" will follow the voting to ensure "fundamental rights" are not violated. Spain's central government is staunchly against the vote, which has been ruled unconstitutional by the courts, and has used all the legal tools at its disposal to stop it from taking place.